The Motion Picture Association of America (MPAA) completed its first update of Content Security Best Practices since the Trusted Partner Network (TPN) debuted in April in a joint venture with the Content Delivery and Security Association (CDSA). The TPN is intended to standardize and improve the quality of assessors and reduce the waste of duplicative audits. Current and future vendor assessments will be based on the MPAA Best Practices, built into the TPN platform to create its Common Controls. “This new MPAA Best Practices update finalizes the program’s transition to the TPN and reflects our association’s continued, 30-year-old commitment to strengthening security processes across production, post production, marketing and distribution,” said TPN chairman Dan Robbins, who is also MPAA senior vice president/associate general counsel. TPN chief operating officer Kurt Fischer added that, “the MPAA Best Practices are designed to provide current and future third-party vendors with an understanding of general content security expectations, as well as a framework for assessing a facility’s ability to protect a client’s content.” “Understanding and applying the MPAA Best Practices is a great way for a facility and vendor to prepare for their TPN assessment,” he said. 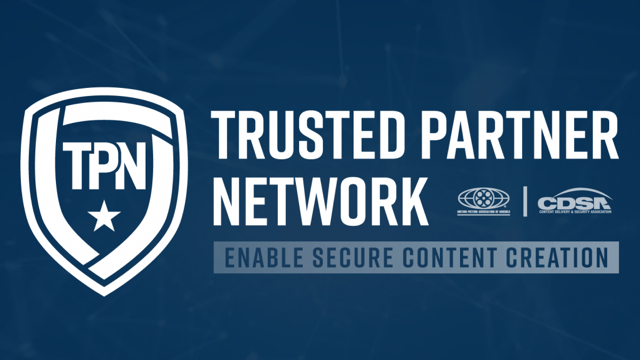 More info about Content Security Best Practices can be found on the Trusted Partner Network site. Details on MPAA projects including Best Practices can be found here.